The owner of this 92' Sunseeker ordered a new boat and needs to sell! : Atlantic Yacht & Ship, Inc.
Word from Joe Marino explains that the owner of the 92′ Sunseeker yacht he has for sale needs to sell! The current owner has already ordered his next yacht and needs to sell before delivery! Launched in 2013, this beautiful 92′ Sunseeker (28 Meter) is one of few currently available. After all, very few of this highly popular fly bridge model are currently on the brokerage market. She is a stunning example of the capacious 28 Meter Sunseeker yacht. 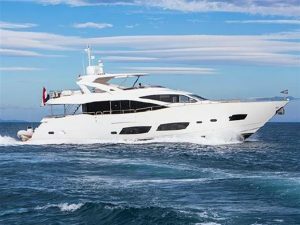 This 92′ Sunseeker has numerous additional extras and fittings. Moreover, it includes the Gold Upgrade Package, carbon fiber hardtop, and TRAC stabilizers. With Tropical spec. air conditioning, Bose sound systems, KVH M9 satellite TV, and more you are good to go! Furthermore, the galley has extensive upgrades with SubZero refrigerators / freezers. In short, this yacht is seriously for sale. This is an excellent opportunity to bypass a long new-build waiting list. The complete specification, professional high-resolution photographs, and details are available upon request. For more information on this beautiful used 92′ Sunseeker yacht for sale be sure to contact Joe Marino today!